This trip to the southern coast of Ireland, allows us to spend a number of days visiting an essentially uninhabited island other magnificent colonies of Gannets, Razorbills, Guillemots, Puffins, Fulmar…in other words an array of seabirds. By visiting for a number of days we will have time to work each and every cove that hosts its own colony and opportunities as well as work with the changeable light and conditions that a period of days generally creates. We have timed our trip for early in the breeding season which will mean birds in prime feather condition and also the most active in terms of behaviour towards each other, whether it be reinforcing relationships or just establishing nesting territories. This is the perfect time for an array of different behavioural image opportunities and what is a truly special place let alone photographic location for seabird photography on a grand scale. Days 2 – 5: Our programme for each of the 4 days here will be very similar and very focussed so that we can be sure of making the most of the array of seabird photography opportunities the island of Great Saltee has to offer. We will leave in the morning for the island on pre-arranged boat with a local fisherman, taking our food and refreshments for the day with us. We will not be returning until the evening light has gone so be prepared for a full day out when the weather may change. A good dinner awaits us on our return every night! Please note that the landing on the island is a wet landing: we will transfer from our fishing boat to a smaller craft (Zodiac) and then need to exit this into the shallow waters – bare foot, Wellingtons or waterproof sandals (best option) are the options available for you, and they can be left on the shore to switch to your more conventional light walking boots. 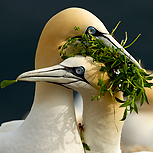 Great Saltee is in our opinion one of the premier locations for photographing seabirds and we will get the chance to photograph guillemots, razorbills, kittiwakes, fulmars and an excellent gannet colony. There are Puffins to be found on the island and also a small number of Choughs as well as numerous warblers and other small birds to be found in the isolated bushes to be found across the island as well. By spending 4 full days here we will have ample opportunity to work across the various species and the numerous inlets and cliff locations they can be found on to develop a diverse portfolio of seabird images. Day 6: We will look to get the morning ferry from Rosslare back to Fishguard and from where you will be able to make your way home. Ferry to Ireland, all travel, accommodation, meals, boat trips and entry fees. The landing on the island requires a decent level of fitness – it is a wet landing (ie into shallow water) and so good stability is required. Onshore there is a reasonable amount of fairly lengthy and occasionally steep walking on paths and access to the gannet colony requires a degree of walking on rocks. This trip involves long island based days but there is plenty of time to rest and go at your own pace throughout once there.